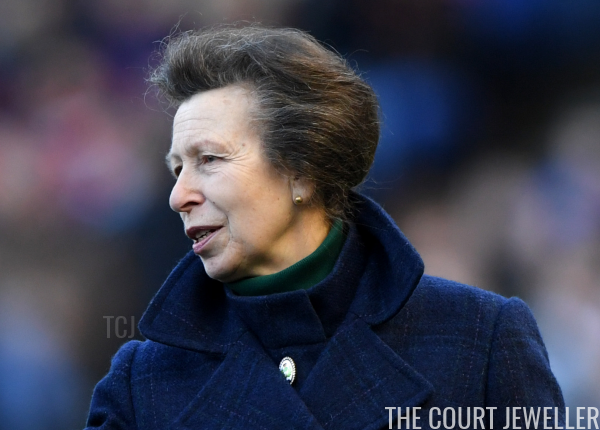 The eyes of the world are on the monarchy of Japan this spring, as Emperor Akihito is scheduled to abdicate in favor of his elder son, Crown Prince Naruhito, at the end of April. 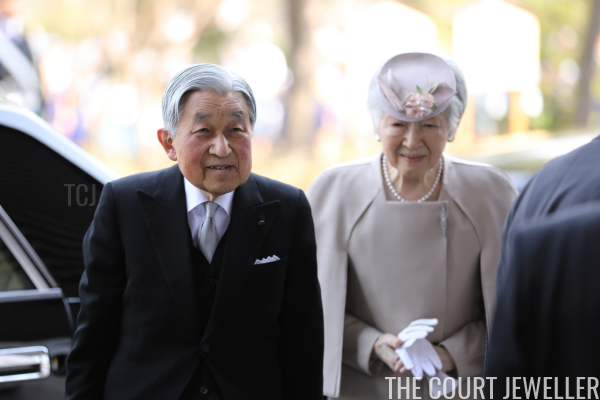 This weekend, the nation celebrated the 30th anniversary of Akihito's accession to the throne. 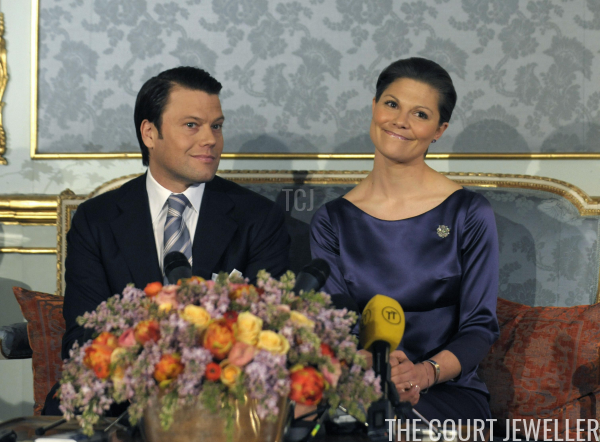 Ten years ago, the royal world got a thrill when Crown Princess Victoria of Sweden officially announced her engagement to her long-time beau, Daniel Westling. 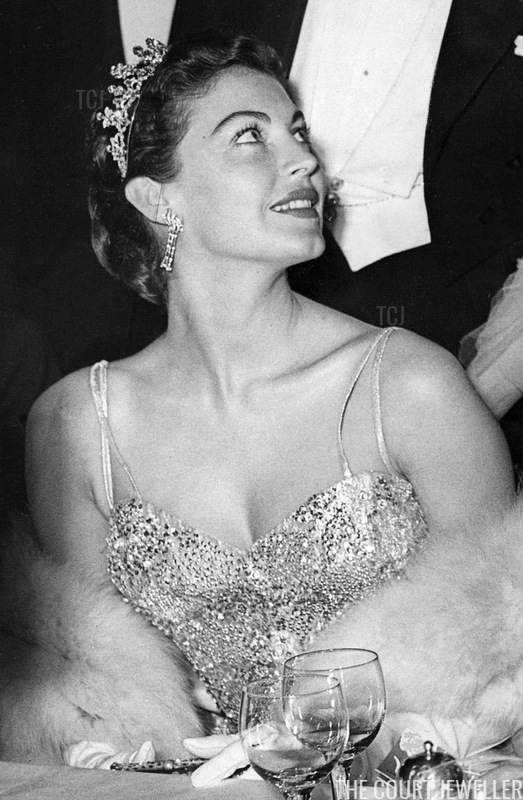 Here's a look back at the jewels she wore during their engagement press conference. 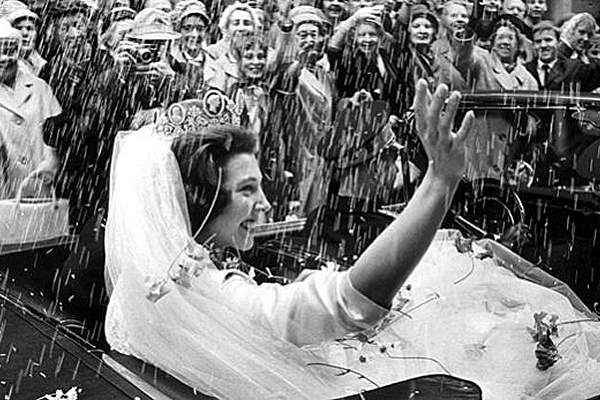 Audrey Hepburn wears her tiara for the premiere of A Nun's Story in London, 1959; more on the sparkler, which was sold in 2017, over here! 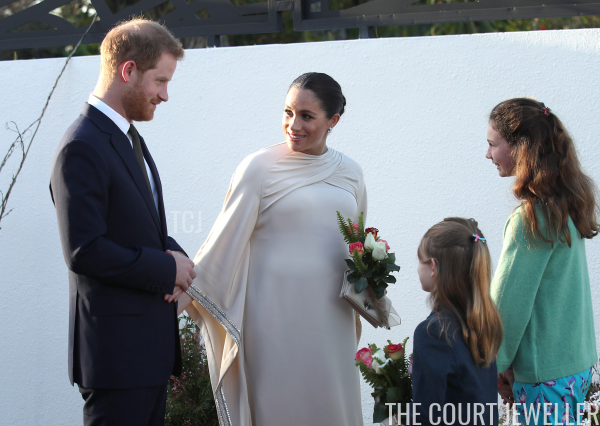 The Duke and Duchess of Sussex wrapped up their official visit to Morocco on Monday, and we've got a roundup today of all the jewels she wore during the trip! 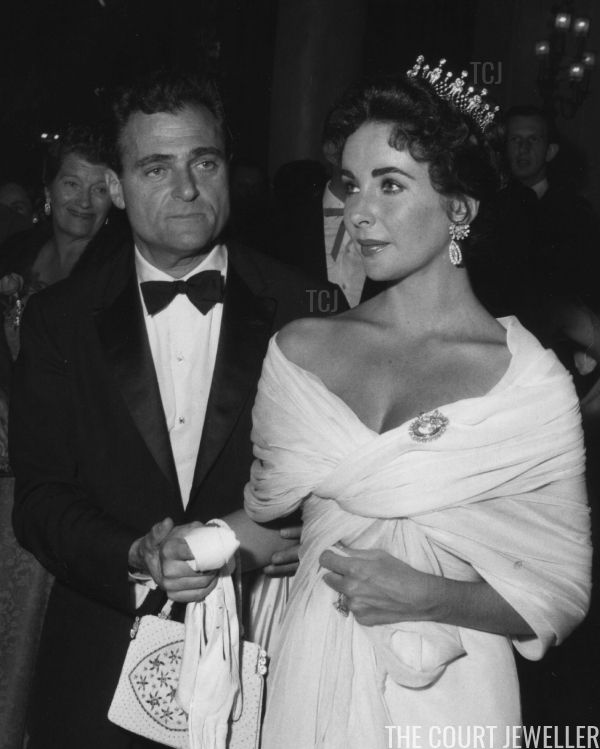 Elizabeth Taylor wears the diamond tiara given to her by her husband, Mike Todd, at the Cannes Film Festival, August 1957; more on the tiara over here! 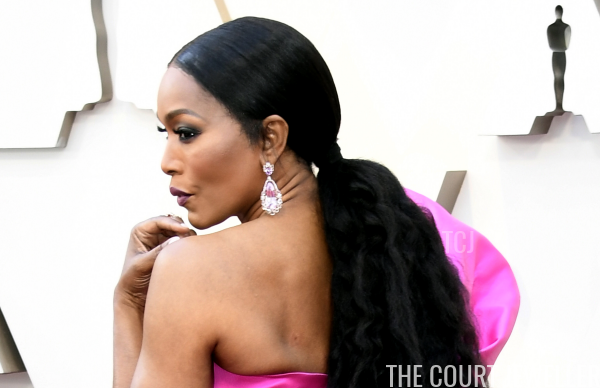 Get our your popcorn and settle in for the show: it's time again for a look at some of my favorite jewels from the Oscars red carpet! 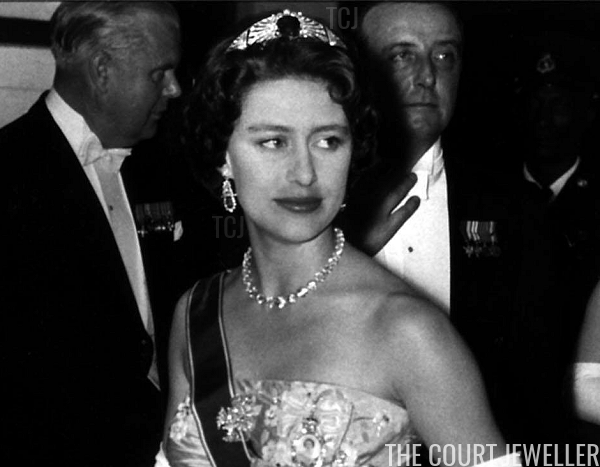 Princess Margaret of the United Kingdom wears Queen Mary's Sapphire Bandeau for a reception in Georgetown during her Caribbean tour, May 1958; more on the tiara's history over here! 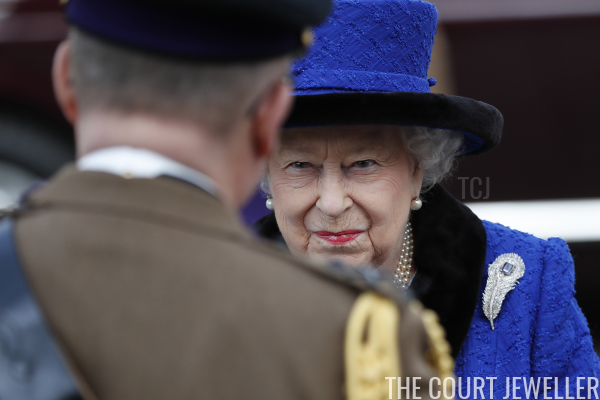 The Queen looked especially regal in London on Friday, where she headed to Wellington Barracks to mark an important royal anniversary. 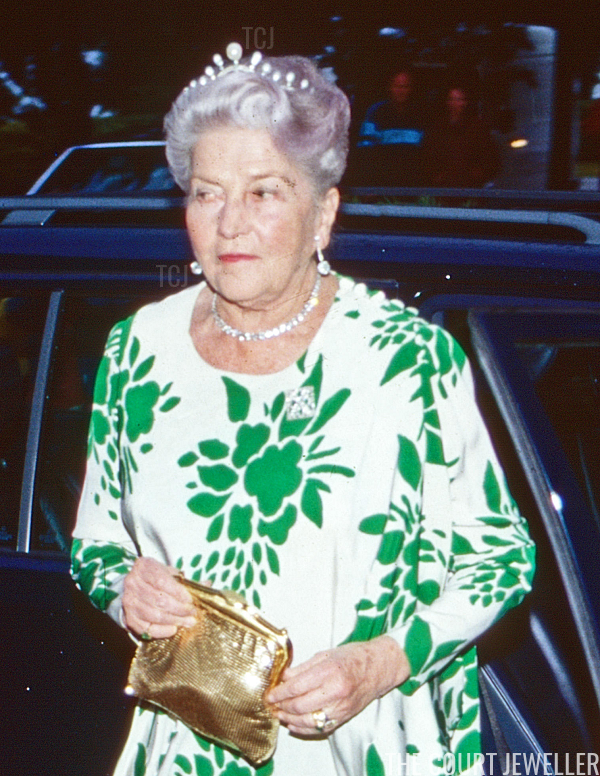 Queen Maria of Yugoslavia wears her emerald kokoshnik for a portrait, ca. 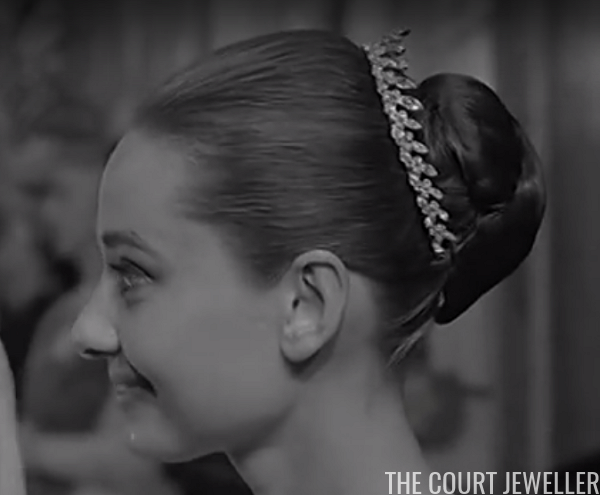 1930; more on the tiara over here! 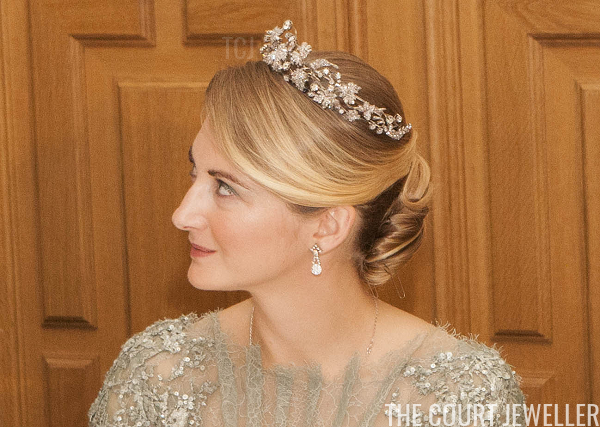 Many royal tiaras become strongly associated with one royal wearer -- but it's a rare tiara that has been worn by four spectacular royal ladies. 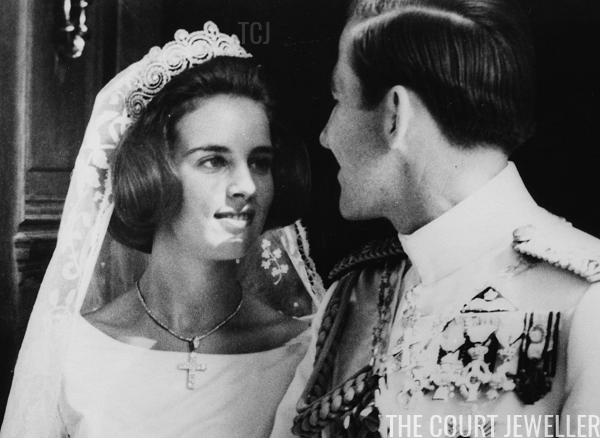 Today's sparkler, Queen Mary's Lover's Knot Tiara, is one of those special cases. We've got all kinds of sparkle in our royal jewel roundup today -- don't forget to vote for your favorites in the poll below! 15. The Duchess of Sussex wore her Pippa Small Herkimer diamond stud earrings with a golden bracelet and her golden "love" ring for lunch in New York on Tuesday. 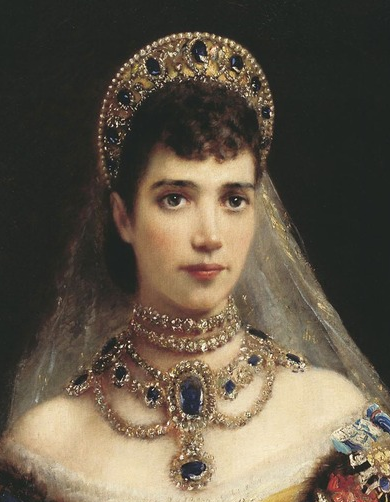 Queen Elisabeth of the Hellenes wears the kokoshnik version of the tiara from the Greek Emerald Parure in a portrait, ca. 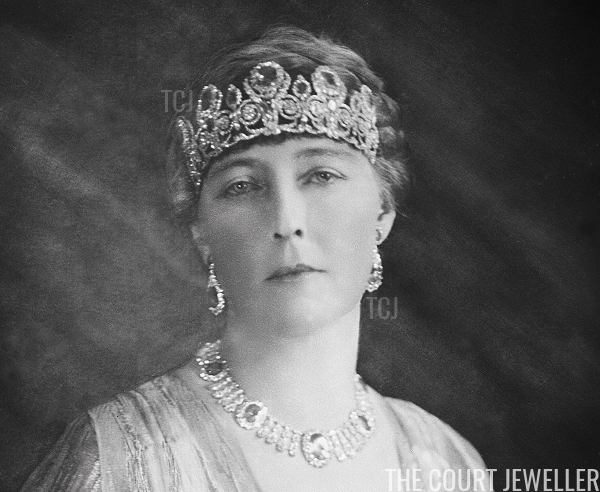 1920s; more on this evolving diadem over here! 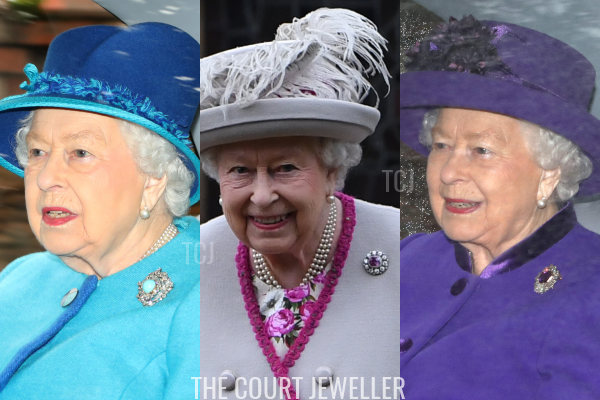 In the middle of February, what could be more appropriate than a bright violet outfit and an amethyst brooch for the Queen at Buckingham Palace? 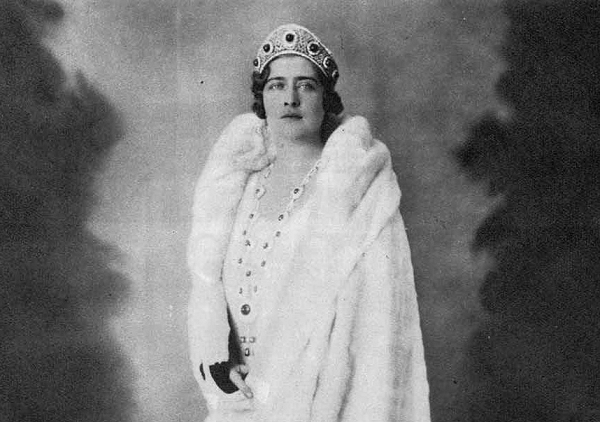 Queen Marie of Romania wears the Vladimir Sapphire Kokoshnik in a portrait, ca. 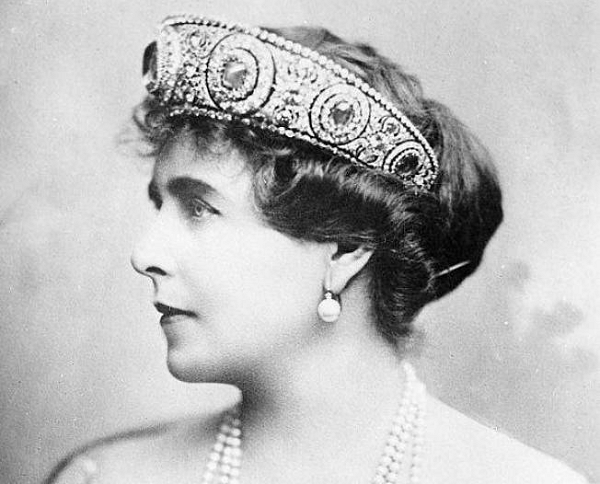 1920s; more on the tiara over here! On Tuesday, we learned of the death of Karl Lagerfeld, the famed designer and creative director of Chanel. 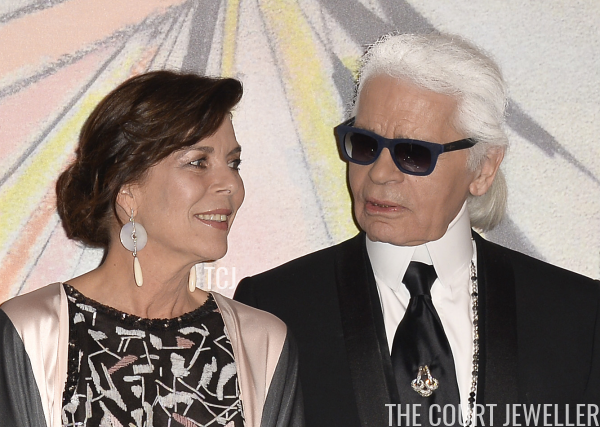 Royal fans will recognize Karl as one of the close friends of Princess Caroline of Monaco. Today, we've got a retrospective of Karl and Caroline together at the annual Rose Ball, an event that he often helped design. 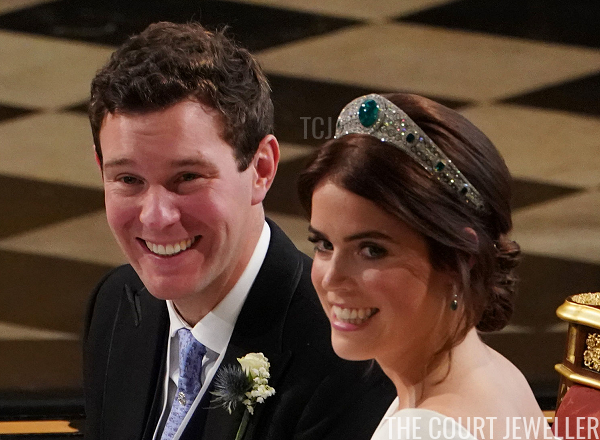 Princess Eugenie of York wears the Greville Emerald Kokoshnik at her wedding to Jack Brooksbank, October 2018; more on the remarkable tiara here! Red is definitely Queen Letizia of Spain's color, and over the last few days, she's worn two pairs of earrings set with gorgeous rubies. 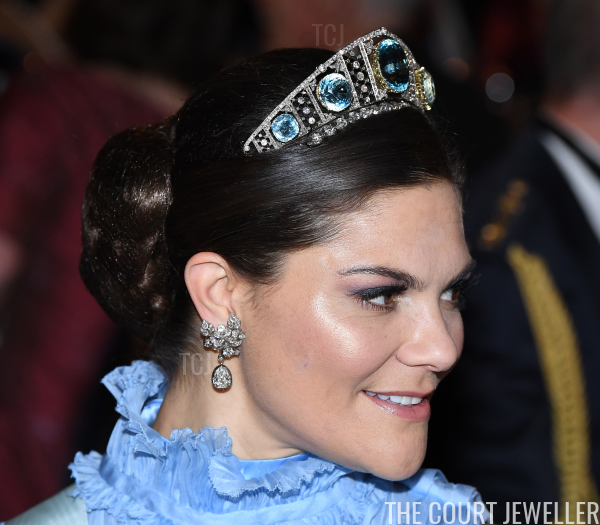 Crown Princess Victoria of Sweden wears the family's Aquamarine Kokoshnik at the Nobel Prize Banquet, December 2017; more on the tiara over here! 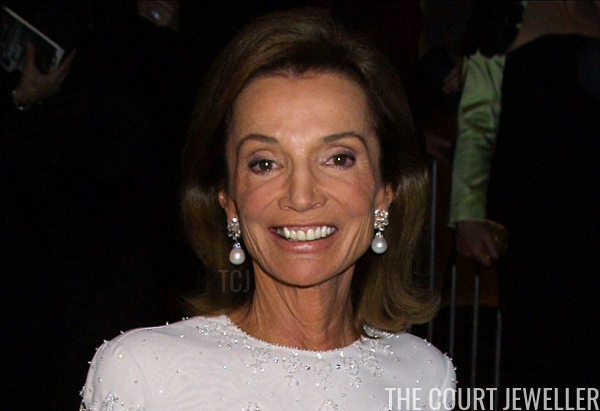 We learned this weekend that Lee Radziwill, the sister of Jacqueline Kennedy Onassis who once married a Polish prince, has died at the age of 85. 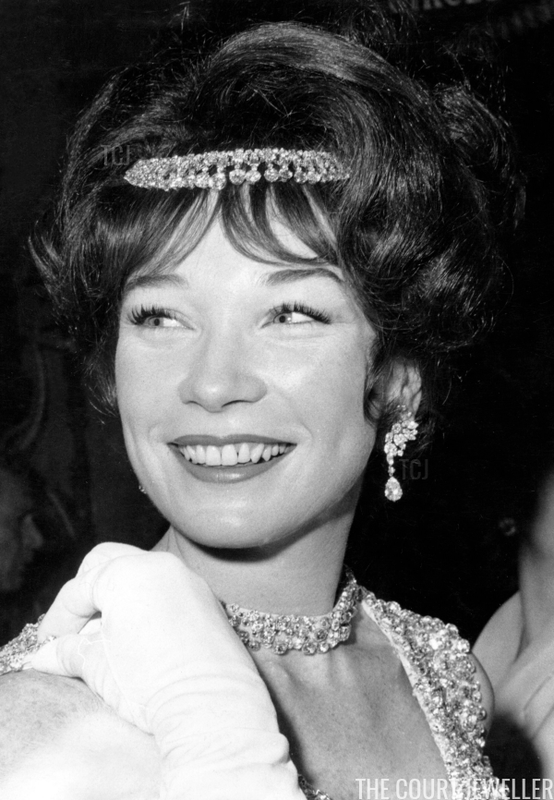 To celebrate her fabulous life, today we're looking at some of her glamorous jewelry looks from the 1960s and today. 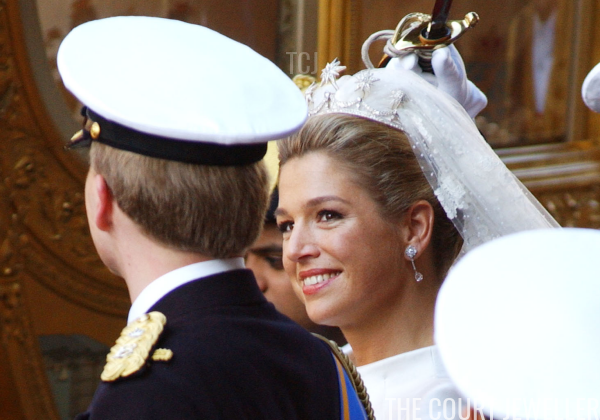 Queen Maxima of the Netherlands wears the Dutch Star Tiara at her wedding to King Willem-Alexander, February 2002; more on the tiara over here! 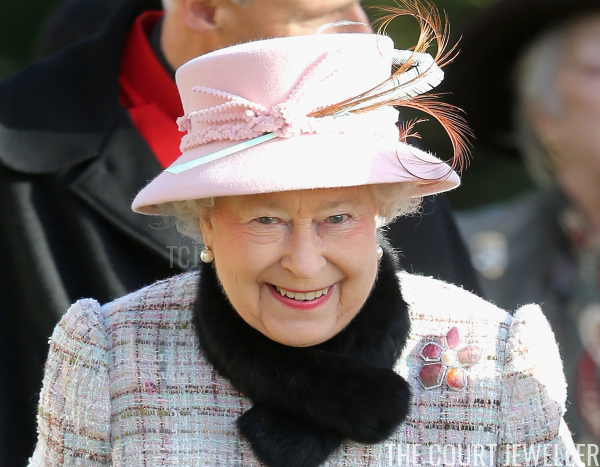 Many of the pieces that the Queen wears on a regular basis have serious heirloom pedigrees, but she also frequently receives new items of jewelry, especially as she reaches major milestones and celebrates big anniversary. 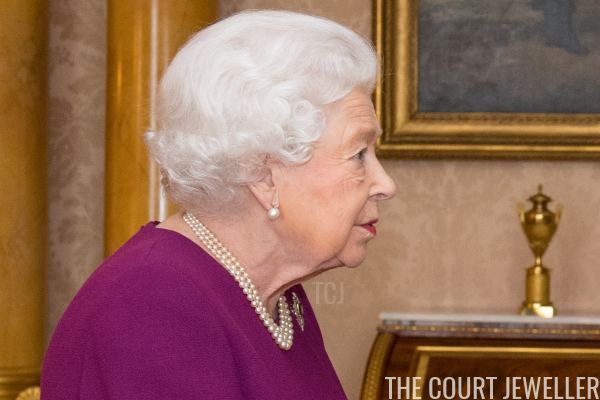 Today's piece, a lovely brooch made of tourmalines, was presented to HM by the Lieutenant-Governor of Saskatchewan. 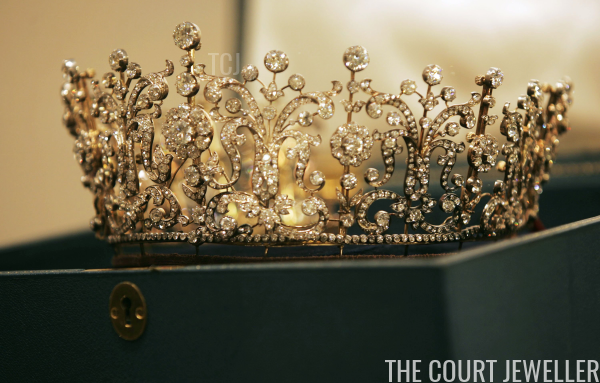 The Poltimore Tiara is displayed at an open house at Christie's in New York ahead of its sale in London, 2006; more on the tiara's history over here! February is the birthstone month of the glorious purple amethyst, and today's sparkler, the Tavistock Amethyst Tiara, features some of the largest amethysts you’ll ever see in a diadem. 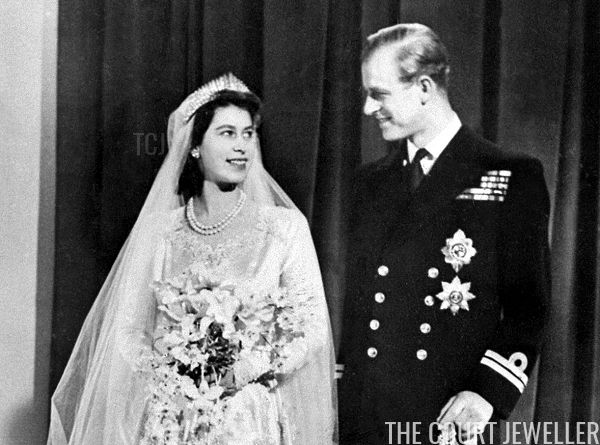 Princess Elizabeth (now Queen Elizabeth II) of the United Kingdom wears Queen Mary's Fringe Tiara for her wedding to the Duke of Edinburgh, November 1947; more on the tiara over here! 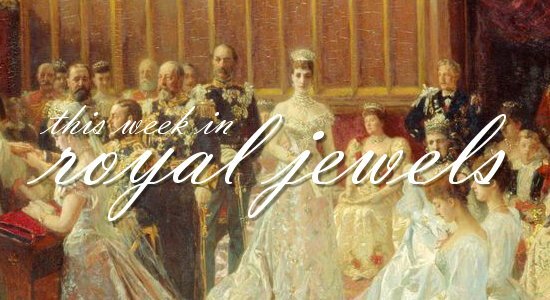 We've got another jam-packed royal jewel roundup for you this week -- don't forget to vote for your favorites in the poll below! 20. For a gala performance at the Natural History Museum in London on Tuesday, the Duchess of Sussex wore her teeny diamond-set clover earrings. 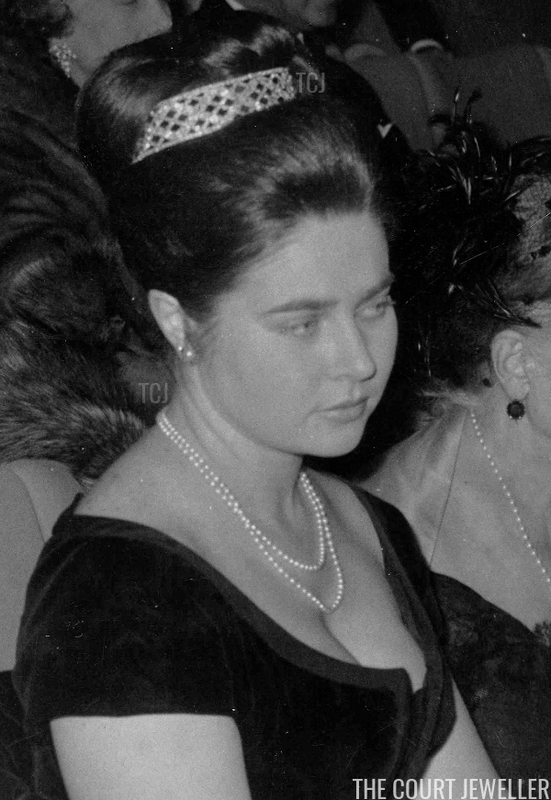 Princess Desiree of Sweden wears the Cameo Tiara at her wedding to Baron Niclas Silfverschiöld, June 1964; much more on this heirloom tiara over here! 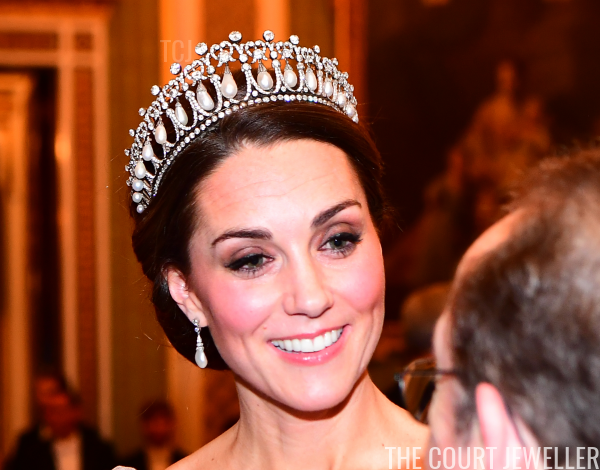 The Duchess of Cambridge was at the Victoria and Albert Museum in London on Wednesday evening, wearing an ensemble and jewels perfectly suited for the night before Valentine's Day. 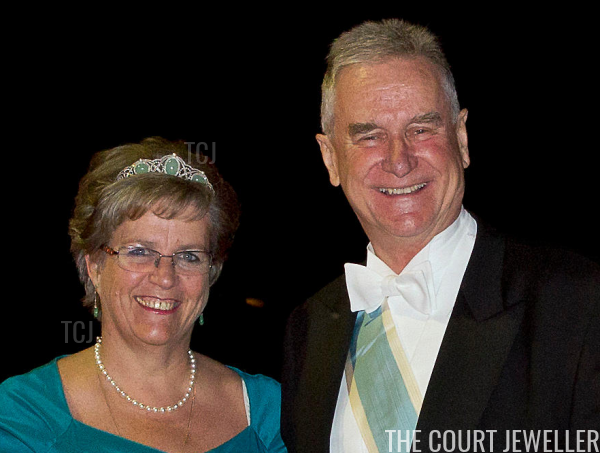 Hereditary Grand Duchess Stephanie of Luxembourg wears the family's Diamond Vine Leaves Tiara at a gala held the night before her wedding, October 2012; more on the tiara here! 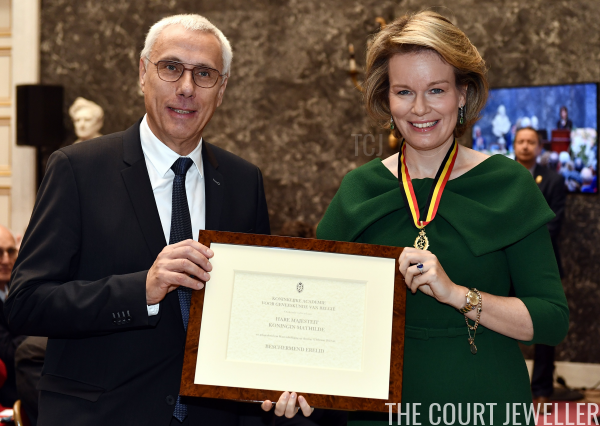 Wearing shades of emerald from head to toe, Queen Mathilde of the Belgians visited the Belgian Royal Academy of Medicine in Brussels on Tuesday. 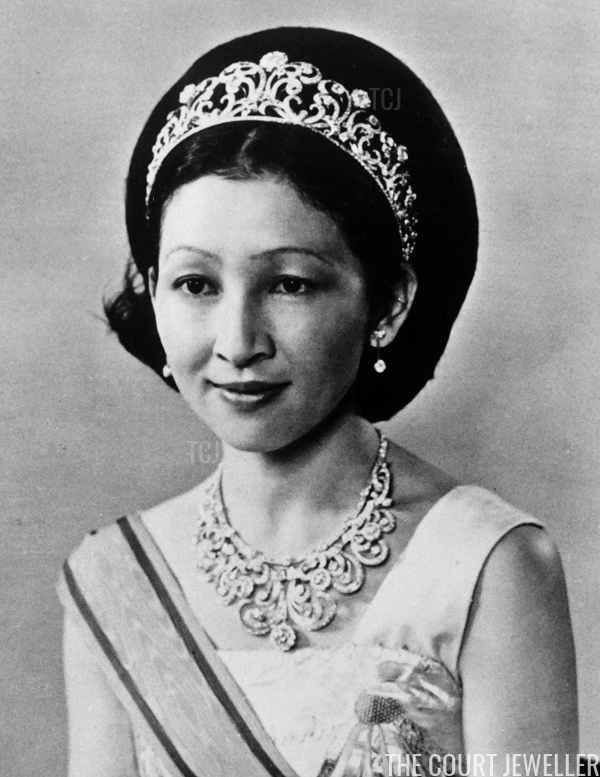 Crown Princess (now Empress) Michiko of Japan wears the Japanese Crown Princely Wedding Tiara in a portrait, June 1971; more on the tiara and its matching jewels here! 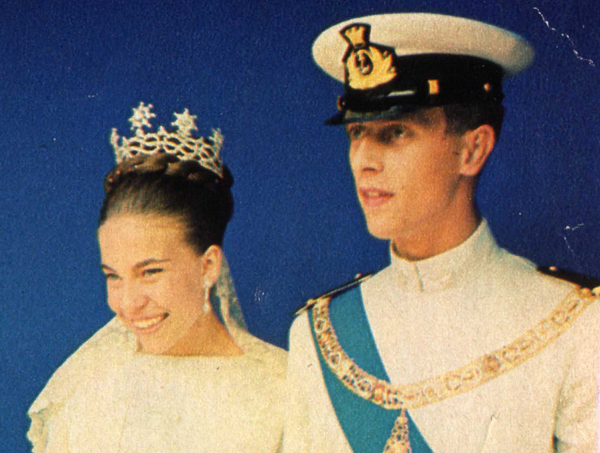 Princess Anne-Marie of Denmark wears the Khedive of Egypt Tiara at her wedding to King Constantine II of Greece in Athens, September 1964; learn more about this important family wedding tiara over here! 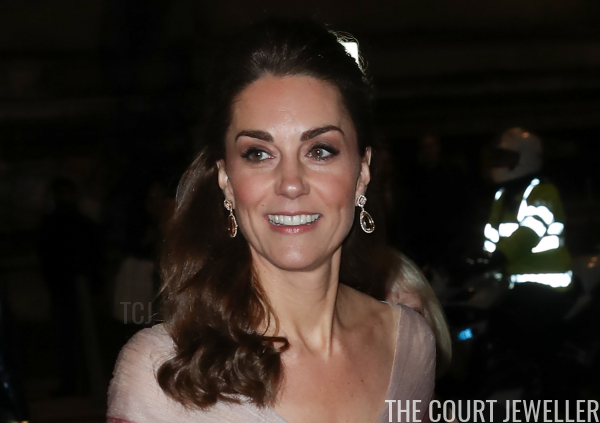 The Duke and Duchess of Cambridge gussied up on Sunday and headed to the BAFTAs -- and Kate brought a couple of very royal pieces of jewelry along with her. Isabelle of Orleans, Duchess of Guise wears the family's diamond and sapphire tiara in a portrait by Boissonnas and Taponier, ca. 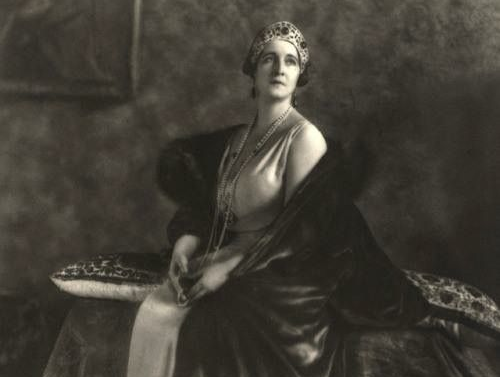 1930; learn much more about the family's sapphires here! 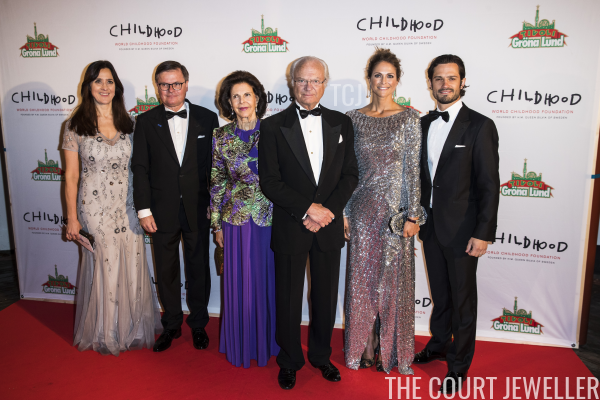 Four members of the Swedish royal family gathered at a restaurant in Stockholm on Thursday to mark the 20th anniversary of one of Queen Silvia's most important initiatives: the World Childhood Foundation. 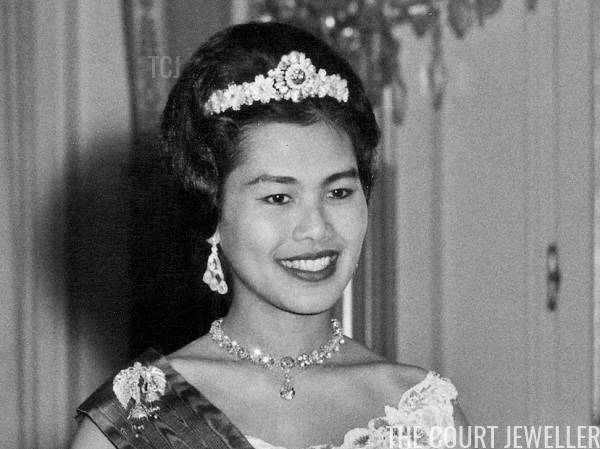 Queen Sirikit of Thailand is the owner of a truly incredible collection of jewels. Today, we're taking a closer look at one of her more modern pieces: her ruby floral bandeau. 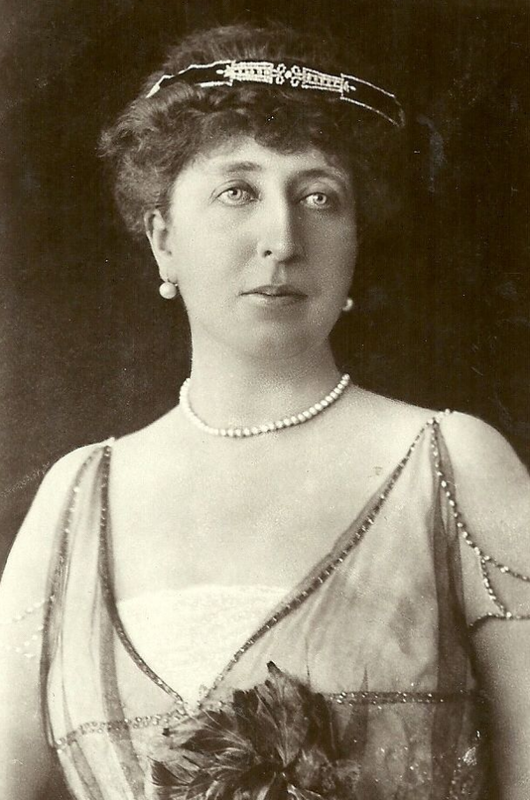 We're bringing back a favorite feature today: "Redesign It," which allows you to exercise your inner Queen Mary! 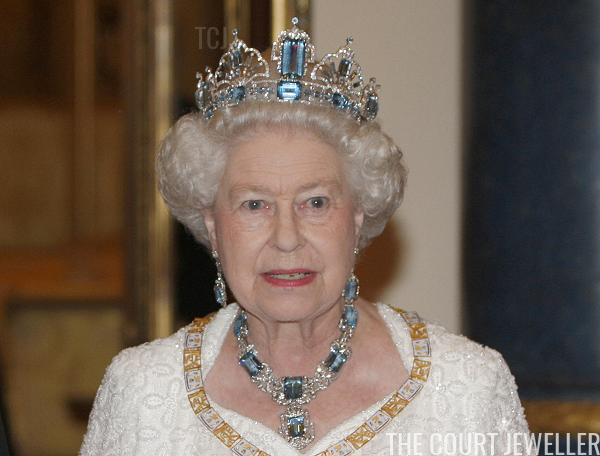 Today's target tiara: the grand diadem from the Brazilian Aquamarine Parure. 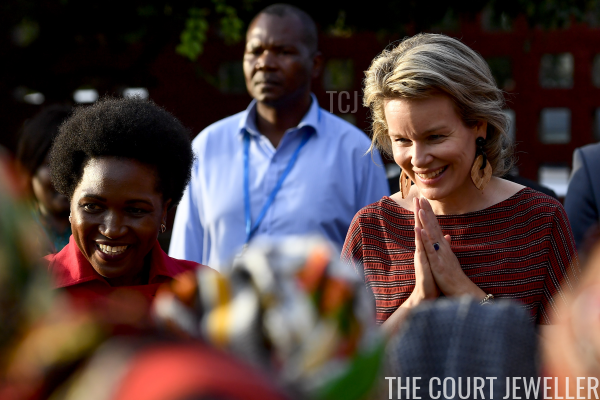 Queen Mathilde of the Belgians traveled to Mozambique this week with the United Nations for a visit focused on sustainable development goals, and we saw a lovely trio of earrings on her first day in the country. 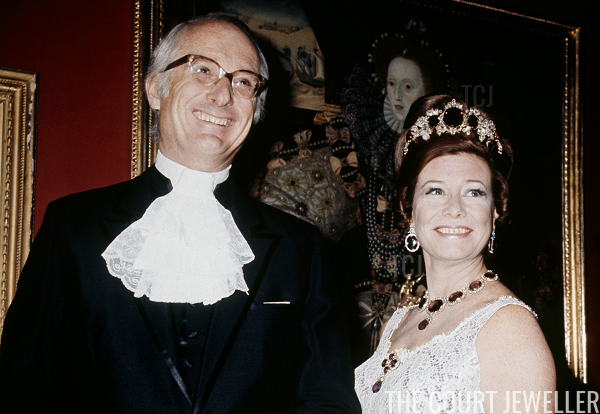 Claude of Orleans wears the Aosta Knots and Stars Tiara for her wedding to Amedeo of Savoy, July 1964; read more on the tiara's history here!